The title track "Puckey Puckey," illustrates both the band's short-form and long-form quest for perfection. Disc One opens with just-under thirty minute take on the song, which Wang says, "shows how the band would linger in a groove to find that elusive magic". It's almost an album in itself. Disc Two closes with the edited version that best expressed Wright's notion of "four minutes of happiness". The first disc is rounded out with two more epic jams plus "Watts Towers," which compilation producer Andy Zax says, in true Watts 103rd Street Rhythm Band style, features, "a riff that the band had been playing off and on in the studio for several years... the vocal riff where they're singing, 'I got a feeling tonight, everything is going to be all right". Disc Two opens with the only non-Wright-penned song, an instrumental version of Otis Redding's "Hard To Handle" that's a shout out to the band's early days as largely a cover act. Among the other highlights are previously unissued alternate versions, including one of their signature song "Express Yourself" and a stripped-down early take of the non-LP single "Wine". In the liner notes, producer Zax says, "Unlike most bands that, when they reached the end of a take, would have stopped and talked about it . . . the Watts Band would simply play". He adds, "the best elements of that . . . showed a side of the band that isn't really documented elsewhere on record. It had a kind of propulsive quality I associate with The Meters or Can or some James Brown records, where the band is exploring the groove. I wanted to find some way to make that available so people could hear this side of the Watts Band that hadn't really been heard before". 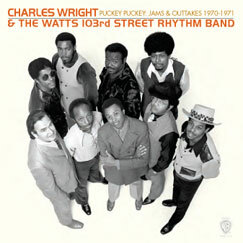 The set is an ideal companion piece to Rhino Handmade's Charles Wright and the Watts 103rd Street Rhythm Band - Live At The Haunted House, which sheds light on the group's onstage prowess at an earlier point in their career.